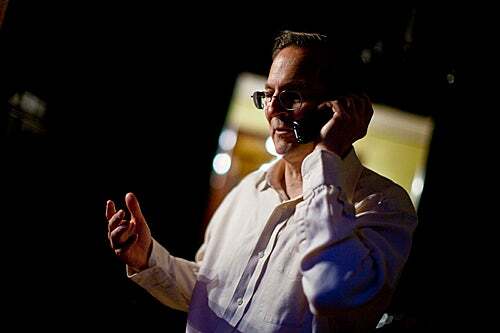 At 6:15 this morning, Jack W. Szostak answers congratulatory calls after receiving the news that he had just won the 2009 Nobel Prize in physiology or medicine. Szostak of Massachusetts General Hospital (MGH) Department of Molecular Biology and Harvard Medical School shares this year's prestigious scientific award with Elizabeth H. Blackburn of the University of California, San Francisco, and Carol W. Greider of the Johns Hopkins School of Medicine. 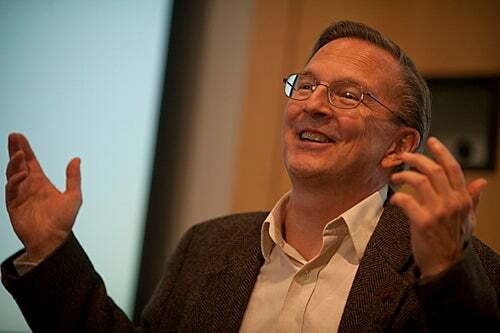 Jack Szostak, a genetics professor at Harvard Medical School and Harvard-affiliated Massachusetts General Hospital (MGH), has won the 2009 Nobel Prize in physiology or medicine for pioneering work in the discovery of telomerase, an enzyme that protects chromosomes from degrading. The work not only revealed a key cellular function, it also illuminated processes involved in disease and aging. Szostak called the prize “the highest scientific honor” and thanked his co-winners and collaborators, Elizabeth H. Blackburn of the University of California, San Francisco, and Carol W. Greider of Johns Hopkins University School of Medicine. “It started off as work on a very basic question that has turned out, to our delight and surprise, to have much broader implications,” Szostak said. The three won the prize for work conducted during the 1980s to discover and understand the operation of telomerase, an enzyme that forms protective caps called telomeres on the ends of chromosomes. Subsequent research has shown that telomerase and telomeres hold key roles in cell aging and death and also play a part in the aging of the entire organism. Research has also shown that cancer cells have increased telomerase activity, protecting them from death. Harvard President Drew Faust congratulated Szostak, saying his achievement highlights the importance of basic scientific research, which may not have an apparent practical application when it is conducted. Harvard Medical School Dean Jeffrey Flier said the work highlights not just the importance of basic research, but also that of the ongoing collaboration between the University and its hospitals — in this case, Harvard Medical School’s Department of Genetics and MGH’s Department of Molecular Biology, where Szostak holds appointments. MGH President Peter Slavin said the hospital was “thrilled and honored” to learn of Szostak’s award and thanked him for his contributions to biomedical research and for advancing the understanding of human biology and disease. In addition to being a professor of genetics at Harvard Medical School, Szostak is the Alex Rich Distinguished Investigator in the MGH Department of Molecular Biology, a member of MGH’s Center for Computational and Integrative Biology, and a Howard Hughes Medical Institute investigator. Szostak’s day began at 4:45 a.m. with a phone call from the Nobel Assembly at Karolinska Institutet in Sweden, which awards the prize. By midday, he said, his phone still hadn’t stopped ringing. Later Monday, Szostak missed the introductory biochemistry class he was scheduled to teach and appeared instead at a news conference at Massachusetts General Hospital’s Simches Research Center. He entered the room, beaming, to a standing ovation by colleagues from the hospital. Matthew Powner, a postdoctoral fellow in Szostak’s laboratory on the building’s seventh floor, said he and the rest of the lab were excited for Szostak. The lab was decorated with congratulatory notes, ribbons, and gold balloons. “I think it’s fantastic news,” Powner said. Telomeres’ existence was hypothesized in the 1930s after scientists observed that, though the ends of normal chromosomes never fuse with each other, the ends of chromosome fragments do. In 1980, Szostak began collaborating with Blackburn. Together they showed that repeated nucleotide sequences found in telomeres of a single-celled protozoan also worked to protect chromosomes in yeast cells, illustrating they had discovered something very basic that worked in a wide range of creatures. Blackburn and Greider went on to isolate telomerase, while Szostak identified a protein essential for maintaining telomeres in yeast, which turned out to be a key component of the enzyme. His work showed that the inability to add nucleotide repeats to chromosomes led to telomere shortening and eventually cell death. This was the first link between the molecular biology of telomeres and cellular senescence, the aging and death of cells. Although this work was not known to be relevant to human disease when carried out in the 1980s, subsequent studies of telomeres and telomerase in human cells have shown that the enzyme plays crucial roles in both cancer and aging. Since his work on telomeres and telomerase, Szostak has shifted focus. Today he is exploring the very beginnings of life, focusing on how the first cells were created. He is co-director of Harvard’s Origins of Life Initiative. With Szostak’s award, 44 current and former Harvard faculty members have been recipients of Nobel Prizes for wide-ranging work, including the tissue culture breakthrough that led to the creation of the polio vaccine, negotiations that led to an armistice in the 1948 Arab-Israeli War, the first description of the structure of DNA, pioneering procedures for organ transplants, and the development of Gross National Product as a measure of national economic change. The most recent Harvard faculty member to win a Nobel Prize was in 2005, when physicist Roy Glauber received the physics Nobel for work on the nature and behavior of light and Thomas Schelling won in economics for work on conflict and cooperation in game theory. Previous winners this decade include Linda Buck, in physiology or medicine in 2004, Richard Giacconi, in physics in 2002, and A. Michael Spence, in economics in 2001. Just after learning he has received the Nobel Prize, Jack W. Szostak, a genetics professor at Harvard Medical School and Harvard-affiliated Massachusetts General Hospital, starts receiving congratulatory phone calls. 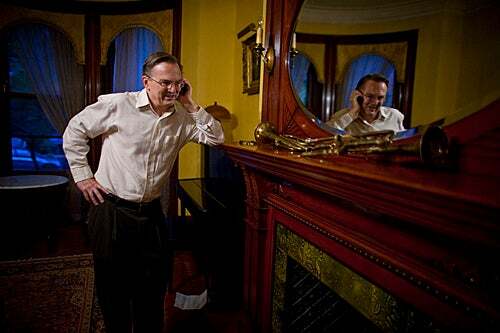 In his Boston living room, Szostak talks to the Associated Press about the announcement of his Nobel Prize. During a press conference at Massachusetts General Hospital on Monday, Szostak is asked about the research that led to the Nobel Prize. 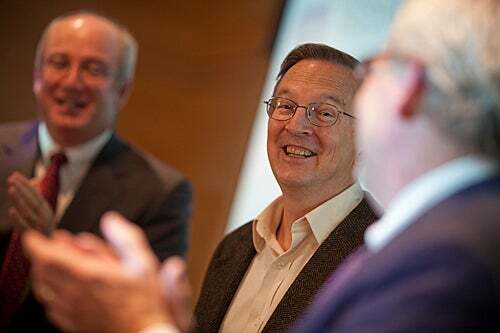 Massachusetts General Hospital President Peter L. Slavin (left) and Robert E. Kingston (right), chief of the Department of Molecular Biology at MGH, applaud Szostak during the press conference.